One of the games that my son has played for any years is Pokemon. He likes to play it on the DS. He has had several versions over the years, and we even had a Pokemon themed birthday party which you can see on the blog. 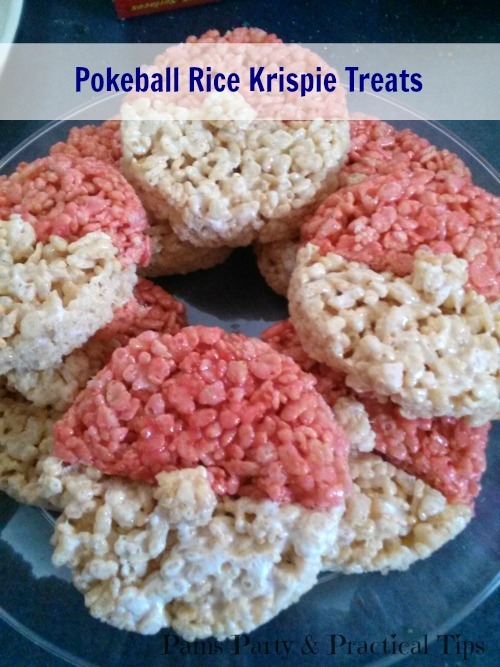 His sister decided to make him Pokeball Rice Krispies Treats. 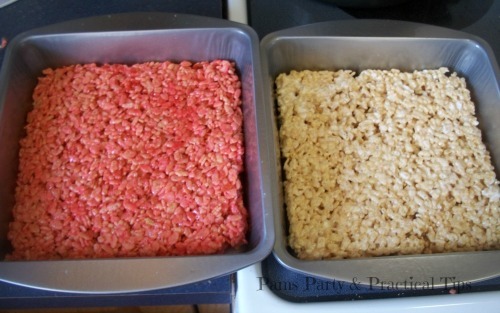 She started with the basic Rice Krispie Treat recipe. 6 cups of rice cereal, a bag of mini marshmallows and 3 Tablespoons of butter or margarine. She split the recipe in half and made two batches. The first batch she left white, and in the second batch she added red food coloring when melting the butter and marshmallows. Each batch fit perfectly into square 8 x 8 pans. The batches will not be super thick and that is okay, because we are going to cut through it with a cookie cutter in the next step. Using a 3 inch circle cookie cutter, she was able to cut 4 circles of white and 4 circles of red. She then cut them in half and mismatched the halves so a red half circle was matched with a white one. When she put them together the marshmallow in the treat was still sticky enough to hold the two pieces together. If you try to make these and yours is not, uses a little bit of frosting, melted chocolate or melted marshmallow as a glue. There are probably several ways you can make the center of the Pokeball. She thought about using black gel and drawing it on. We also briefly thought about making circles out of melted chocolate. Since we were in a hurry to finish before her brother got home, she just used some of the leftovers from when she cut the circles. 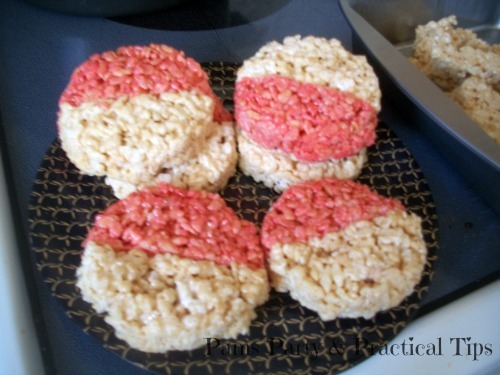 You can definitely tell that they are Pokeballs, and she didn't have to make a mess with the chocolate or gel. 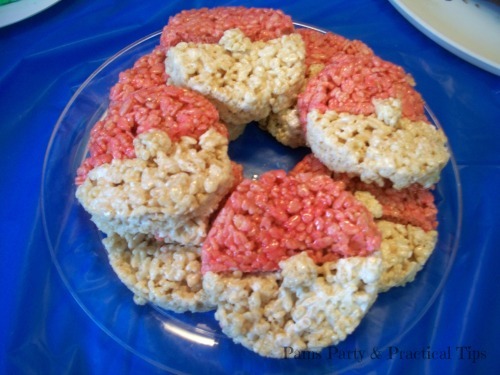 These would be perfect to make for a Pokemon party or just because you love to play the game. 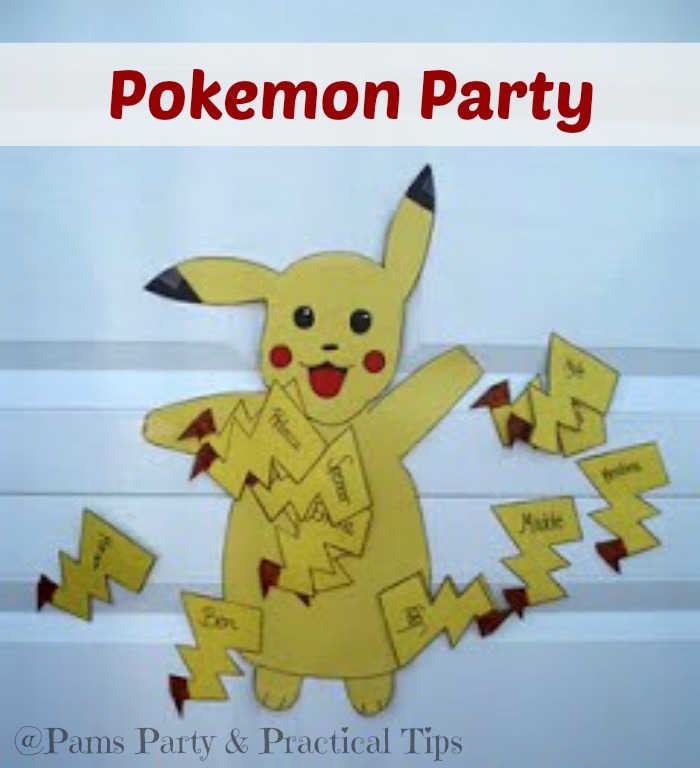 Now go out and "Catch them All"
Want to see more Pokemon party ideas, check out my son's Pokemon Party. He has had a lot of birthday parties, and says this one was his favorite. My kids will love these! Thanks for sharing! All 3 of my kids still love Pokemon even after all these years. Probably because they keep coming out with new games. My boys loved pokemon when they were little. All 3 are in their early 20's now. I bet if I made these they would get a kick out of it! Fantastic easy treat. I'll bet your son loved them. Such a funny idea! And EstheticGoddess, I'm married to a man in his 20s who used to like Pokemon as a kid. I also have 2 nephews that love it.